Let your Excel skills sore to new heights with this bestselling guide. Updated to reflect the latest changes to the Microsoft Office suite, this new edition of Excel For Dummies quickly and painlessly gets you up to speed on mastering the world's most widely used spreadsheet tool. 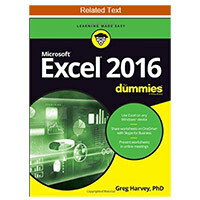 Written by bestselling author Greg Harvey, it has been completely revised and updated to offer you the freshest and most current information to make using the latest version of Excel easy and stress-free.If the thought of looking at spreadsheet makes your head swell, you've come to the right place. Whether you've used older versions of this popular program or have never gotten a headache from looking at all those grids, this hands-on guide will get you up and running with the latest installment of the software, Microsoft Excel 2016. In no time, you'll begin creating and editing worksheets, formatting cells, entering formulas, creating and editing charts, inserting graphs, designing database forms, and more. Plus, you'll get easy-to-follow guidance on mastering more advanced skills, like adding hyperlinks to worksheets, saving worksheets as web pages, adding worksheet data to an existing web page, and so much more.